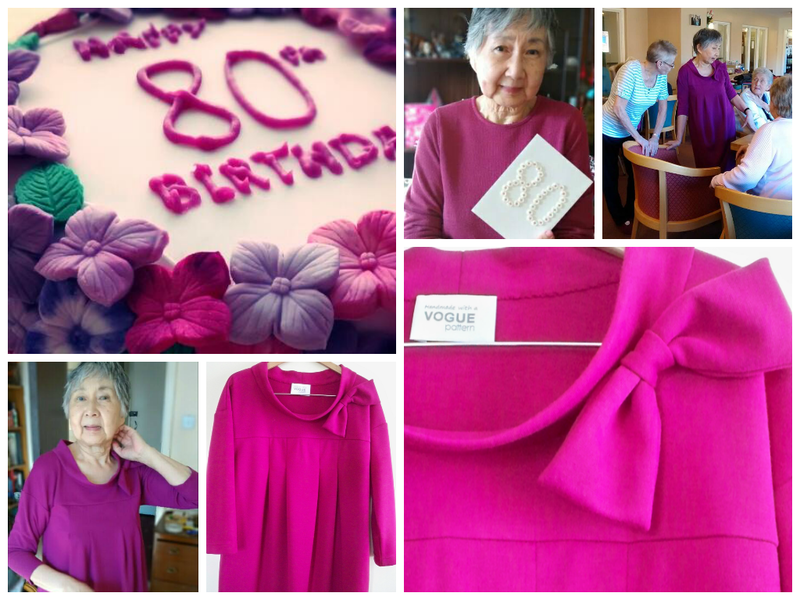 In my last post, I mentioned buying more (yet more) patterns for a very special cause: my mum’s 80th (yep, 80th) birthday. The Japanese cotton is lovely, of course, but too dark/dull for special-occasion wear; plus, trying to ensure the right fit when actual fitting sessions are not possible (we live several hours’ apart) with a woven cotton .. yeah. Not so good. Hence the idea of a jersey dress in a flatteringly retro sack style to skim over any post-party-cake curves. I knew what I had in mind, once I’d chanced upon this design at StyleArc; some fullness at a jewel neckline to create extra ease over the stomach area, straight sides tapering into a narrower hem (to retain elegance), elbow-length sleeves and in-seam pockets. Gotta have pockets. Lightweight ponte jersey felt the most appropriate, ensuring it would hang beautifully, avoid cling and be wearable during any less than clement months. As for my colour choice; well, what does a girl need on her special birthday? A pink party dress. What else? While I reduced the bust to waist depth (she’s dinky, like me), I extended the overall length at the hip extension line so that it would finish below knee length. Hey, she’s a lady; the knees are staying covered, thanking you kindly. With the pattern pieces pinned onto the fabric, I used tailors chalk to redraw a straight line from below the armpit to the hip point, removing the waist shaping and to increase the ease at the waistline. A simple adjustment to accommodate a more apple shape. 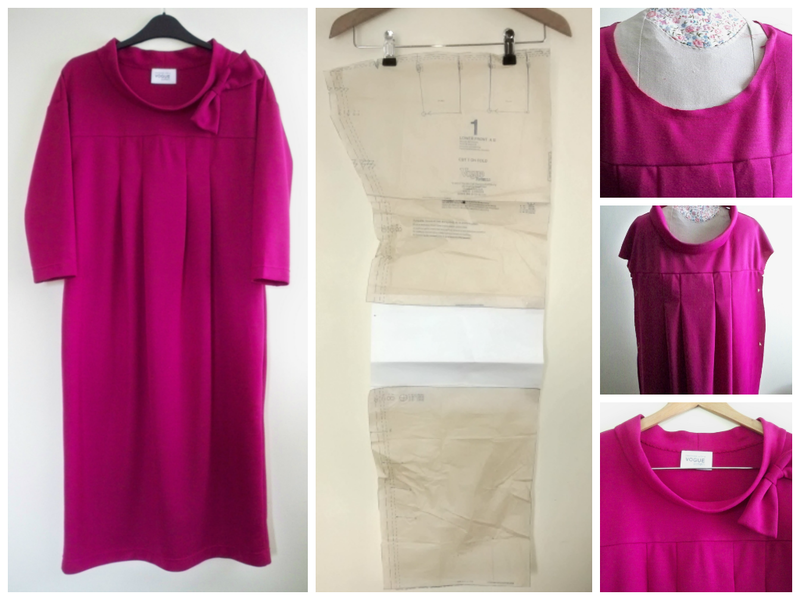 A photo of the completed dress on an official website showed the pleats pulling out unflatteringly over the bust; I chose to stitch them down to the basting/matching point indicted on the pattern. The original neckline was a simple turn-and-sew with bias binding; great for a casual dress, but a little lacking in the pizzazz required here. So I measured the neckline at the stay-stitching line and, with some experimenting to gauge the height, drafted a simple stand-up collar which fitted first time (ayethankyooo), which also helped to echo the 1950s sack-dress aesthetic. And with some scraps left over, the obligatory finishing touch; a detachable bow. Perfect for the big day or the occasional cocktail, but removable for those more casual moments. My verdict? It’s pretty easy to sew, but the fabric choice is crucial if you don’t want it to look like a night-dress. With that said, I am kinda planning to make one for myself. Sans collar. Possibly as a night-dress. Ha. But the verdict that really matters is my mum’s, of course. And she loved it. Why? Because of the comfort it affords; it’s a really comfortable, effortless dress to wear. She also loved that she could boast to her friends that her daughter made it .. and because it has pockets. Yep; that was the real clincher. Never underestimate the power of a damn fine pocket, people. So, my intention to complete a project each month is still on track [air-punch]. And, more than that, I made my momma proud. Many many levels of sweet, sweet win. What a gorgeous dress! I can’t believe your mum is 80! She looks so young and stylish in this outfit and the colour is perfect on her. Good work! Thank you! She regularly fools people into thinking she’s younger than she is, lol. It was a challenge to find something age-appropriate without it being ageing, and finding the right colour was key, so thank you for your feedback!